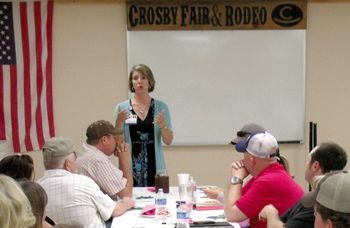 CROSBY  San Jacinto Methodist Hospitals Director of Cancer Services came to a meeting with the Crosby Fair & Rodeo Board and the Tough Enough To Wear Pink Committee on Monday night to talk about where the funds the Rodeo donated were spent. By the time of the meeting adjournment, the Cancer Services had received ringing endorsements and pledges for future support from the active rodeo members. Denise Martinez, an oncology registerCed nurse, at San Jacinto Methodist Hospital is directing cancer care for the hospital and described in detail how two checks were used for patient care that the Crosby Fair & Rodeo wrote through their efforts to the hospital. One of the checks was for about $5,000 that went to the San Jacinto Methodist Cancer Center Pink Heals Endowment from the first Bras for the Cause Donation. The second check was for $30,087 and went to 15 patients from the Pink Heals Endowment Fund 2011-2013. Martinez told the group that when she became an oncology nurse she expected to hear folks that had just been told they had cancer say, How can we treat this? What is going to happen to my family? but instead heard, I dont have time for this. and I need my job to pay bills. At San Jacinto Methodist Hospital the Navigation Nurse for the Oncology patient enables the access for local recipients. The funds break down such that none of these funds however go to the doctors or health facilities providing the medical service but go to handle bills. Five grand for one patient means $890 for the car note, $1,969 for medication, $1,350 for the mortgage and about $891 for utilities to assist the patient as the patient can concentrate on getting medical services. Some $10,034 went to Cobra Insurance from the second check, $2,790 went to dental care, some $5,665 went to utilities, mortgages accounted for $7, 543, car notes took $1,943 and medication accounted for $2,112. American Cancer Society expenses in 2010 were broken down into 15% for adult cancer research, some 21% goes to fund-raising, about 7% goes to administering the program, one percent goes to childhood research, 15% goes to public awareness, education and legislation, some 21% goes to grants for screening and mammograms and finally about 29% goes to patient support including on-line support network, transportation to medical services, navigation (telephone resource for access to resources,) appearance aids, like wigs, prosthesis and finally lodging or those needing to travel for services. So, Saturday, June 22, when your neighbors and friends ask you to wear pink to the Crosby Fair & Rodeo so the American Cancer Society can get funds from sponsors for those that care enough to be tough enough to wear pink, now you know what difference it makes. 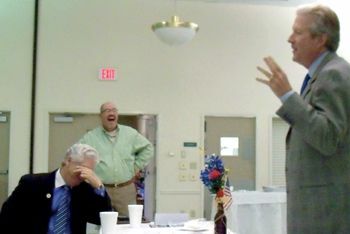 HIGHLANDS  Speaking at the weekly Rotary Club luncheon, Gilbert Santana, spokesperson for the Goose Creek Facilities Planning Committee explained the need for a new bond issue, and the benefits that will accrue to the school district and its students. Voters will be asked on May 11 to consider and approve two bond referendums, totalling $267.54 million dollars and providing for new construction of three elementary schools, a new technology center, and a new transportation center. Also the funds will be used for maintenance upgrades on all Goose Creek schools, and implementation of comprehensive technology and safety improvements. The bond proposal is a result of a study made last fall by an ad hoc Facilities Planning Committee. This group, with the help of demographic and architectural consultants, decided that the projected growth of students in the district required the construction of new schools, and at the same time suggested upgrading of all facilities to keep up with eductional standards and to prepare Goose Creek students properly to compete in the future. The district currently has about 21,500 students, makeing it the 58th largest in the state. Growth is currently occuring at between 1 and 2%, and will continue at this pace or greater. This means that in the next ten years, the district must accommodate another 4,500 students, Santana said. In addition to meeting the needs of population growth, the committee saw the need for modernization of existing facilities, the need to add up-to-date technology, new facilities, and safety improvements at all campuses. The committee recommended a total of $340 million in improvements to the GC CISD board of trustees, but the board decided to split the proposal into three parts. Propositions I and II are the subject of the $267.54 million bond referendum, and a remaining $70 million will be accomplished with other funding. Safety and Security improvements, which seem necessary in todays environment nationwide, will include controlled access vestibules, fencing, and cameras in all the schools. The bond proposal also includes other facilities that the district needs. These include a new Data and Technology Center, on a 15 acre site at North Main and W. Archer in Baytown, with a $7.16 million figure. Also planned is an expansion and upgrade of the Agriculture Center, $5.7 million, upgrades to Stallworth stadium $1.2 million, and a new transportation center and bus garage and maintenance, $10.75 million. Santana explained that in addition to emphasis on technology and STEM education programs, the district wants to insure that career programs in automotive and air conditioning, welding and related industrial fields are planned, too. Joint programs with Lee College are also being developed for these industrial fields. Three new elementary schools are planned, each costing about $22 million. Santana said that at this time, no expansion of middle or high schools is required for student population growth. The bond issue will result in a modest increase in taxes to district residents. It is anticipated that for a homeowner with a $100,000 house, the additional taxes would be $97.80 per year, or only $8.15 per month. For a home valued at $200,000 the increase would be $215.16 per year, or $17.93 per month. For citizens 65 years or older, with a homestead exemption, there will not be any increase in their taxes. Santana encouraged citizens to consider early voting, which will run from April 29 through May 7. Central locations for this are the GC CISD Administration Building, and the Lee College Admin Building. Hours are 8 a.m. to 5 p.m. through May 3rd, and May 4th 7 a.m. to 7 p.m., May 5th 1 p.m. to 6 p.m., and May 6th and 7th 7 a.m. to 7 p.m. In addition, Temporary Early Voting will be at Harlem Elementary April 30th 5:30 to 7:30 p.m., Highlands Elementary May 2nd 4 p.m. to 7:30 p.m., Goose Creek Memorial High School May 3rd 6:00 p.m. to 8:00 p.m., Highlands Jr. School and Hopper Primary May 7th 5:00 p.m. to 7:30 p.m.
Election Day is May 11th. HIGHLANDS  Lee College is asking voters to approve a $40 million bond inside the Goose Creek Independent School District, plans were announced at the Highlands Chamber of Commerce luncheon last Thursday. Dr. Dennis Brown, who became President of Lee College in February 2012, gave the facts about the bond. He also discussed accomplishments of Lee College including statistics that of 1100 community colleges in the nation, Lee College is number five in the number of Science and Technology degrees awarded. Lee College is number 11 in the nation in the number of Bio-Technology Awarded Annually. The Lee College tax increase is to expand the simulation lab at the college, research the opening of a Health Clinic on campus, upgrade classrooms, laboratory facilities, create space for new Physical Therapy Program, Occupational Therapy Program and other allied health programs. Also included is an upgrade to Rundell Hall including a first floor one stop shop for student services, a second floor university center, testing center, administrative offices, and a business and conference center. The cost of the bond for tax payers is a tax rate increase of $1.75. The homeowner with an appraised value of $100,000 is to pay $1.17 per month more property taxes. Future expansion of business and industry may take some of that burden away from taxpayers. Senior Citizens will have no tax increase on the frozen level on the homestead of taxpayers who have applied for and received the age 65 freeze unless they have property values exceeding $93,750. The Board of Regents reduced the 2012 tax rate by 1¢. The college has not had a bond referendum since 1999. Election day for the Lee College Bond is May 11 with early voting beginning April 29 and lasting until May 7. 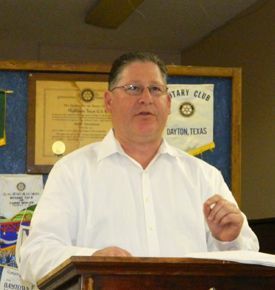 Precinct 3 Justice of the Peace Don Coffey gave a presentation of why the bond should be passed. He, his wife and his son graduated from Lee College. The modest bond passed in 1999 was a success and the college has been conservative on how the college has expanded. The McNair Center has been funded from grants and now is an industrial training area. After the bond it will become a medical training center. The focus of Lee College is workplace development and this is critical to development of business locally, with a goal of student success. The current tax rate is based on no growth in the tax base, while the Goose Creek Consolidated ISD tax base depends upon expected expansion in local petrochemical businesses within the district. If Lee College used the expected expansion model for projection, they would have no increase in the rate at all. So we can borrow this $40 million at such a low rate that we can get a rate of $1.75 if there is no growth over the next 20 years. Our employees wanted $70 Million to do various things but we are very conservative. I feel certain it will come back in huge rewards. said Judge Coffey. CROSBY  It is time to decide how much preparation the Crosby Independent School District needs in new buildings and facilities. Early voting on the Crosby ISD bond begins April 29 and runs through election day May 11 except for Saturday and Sunday. The early voting will be at the administration building from April 29 through May 3, 706 Runneburg Road and election day at the same location for other locations and times see the Crosby ISD Bond Ad on Page 8 or call (281) 328-9200. The Friends of Crosby ISD indicate that the Capital Facilities Program is estimated to cost $86.5 Million and if voters approve the tax rate increase, it will not exceed 23 cents per $100 valuation. The average home in Crosbys district is said to have a fair market value of $107,245 and be taxed on $92, 245 after the state exemption. That average home can expect to pay about $17.68 more in taxes per month or $212.16 per year. No tax increase is placed on the frozen level on the homestead of taxpayers 65 years of age and older who have applied for and received the age 65 freeze. That freeze does not apply to increased home values resulting from new improvements made after the effective date of the freeze. A bond to build a new high school with new JROTC building, athletic field house, agriculture barn, tennis courts, fine arts facility, auditorium and District-wide Tech Center; convert the current high school to middle school, renovate the middle school into an elementary school, and make the Kindergarten Center into a Early Childhood/Pre-K, Kindergarten program combined with the current Crosby Elementary School, construct a new auto stacking drive at Newport Elementary School and renovate elementary school playgrounds and make district wide maintenance and repairs. That is Phase One of two phases, it is an increase of taxes for one year and to be used only for building and maintenance capital projects within the district. The second phase would only come into effect when there is sufficient growth to provide the funding. The second phase is to construct a new competition baseball and softball fields, renovation of Cougar Stadium with increased parking, a new press box, new home seating (this time facing East) with restrooms and concession stands also a second phase of district wide repairs and maintenance. If approved the Phase One planning, design and construction documents will require about 11 months dependent upon the project scope to be completed. Then the plans will be released for competitive bids and pricing for about six weeks. After finalizing proposed pricing, construction would begin about a month later. Estimated completion dates are Fall of 2016 for the new high school, conversion of the high school into middle school and conversion of the middle school into an elementary school. Currently the State contributes to the Districts annual payments on bonds that are outstanding. State Assistance comes from two programs, the Existing Debt Allotment and the Instructional facilities Allotment. Bond elections are presented to voters in the form of a ballot proposition to approve or deny the school district the ability to issue or sell an amount of bonds. The grade re-alignment approved by Board of Trustees will go ahead regardless of the outcome of the bond referendum. CROSBY  The Newport Golf Course and Convention Center hosted Tees and Tails the 49th Annual Fund-raiser for the Crosby-Huffman Chamber of Commerce. The Tees aspect of the event was a golf tournament that featured much effort by the folks at United Community Credit Union for working the committee and set up of the event and ACE Sponsorship. The Crawfish Shak contributed cooking and thousands of Crawfish and shrimp for the Tails portion of the event. Winners of the Golf Tournaments first Morning Flight were United Community Credit Union with golfers Ken Junck, Joe Stephens, Ira Newsom and Emmett Lewis. 2nd place went to Arlans Market with players John Martin, Steven Nicholson, Jonathon Tullos and Teresa Henriquez. The third place spot went to Matera paper featuring golfers David Harringer, Mark Salvaggio, Chris Ohrn and Carl Simmons. The Crawfish Shak that contributed so much to the Tails portion of the event also won first place in the heavily contended Evening flight. 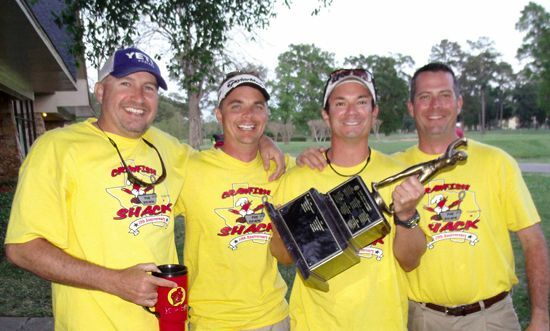 Mike McComb, Casey Nickel and Andy Shoop with Todd Carroll represented Crosbys most numerously attended restaurant. Luna also won longest drive. Closest to the Pin was Christy Henderson and Most Honest Team was Blisco. Eddie Foster sang and played disc jockey for the event and the Lions Club dished up the fish. HIGHLANDS  Authorities arrested a 19-year-old man here Tuesday after an 83-year-old longtime resident was fatally shot Monday night at his home and his pickup was discovered missing. Otis James was found lifeless by a neighbor checking on his welfare at about 8:25 p.m. in the 100 block of South 4th Street, say Harris County Sheriffs Deputies. Family members were called to the scene by the neighbors. Deputies said James was found sitting in a chair in his living room with blood on his shirt from more than one gunshot wound. Forensics has yet to establish a time of the shooting. The missing vehicle is described as a white 2012 Ford F150 Crew cab with a disabled license plate 5GPWM. Harris County ESD#5, from Crosby, pronounced James dead at the scene, shortly after arriving. Investigators later identified Randy Segura as a person of interest in the case after questioning several people at the scene that night. They did not release details about Seguras possible connection to the shooting but local sources indicate that he is related to a nearby tenant at property owned by James. The Ford F-150 crew cab pickup was missing from the home but discovered near Dell Dale Road on Jacinto Port Boulevard in Channelview on Tuesday morning at about 10:00 a.m.
Deputies said Randy Alen Segura was taken into custody shortly before 2:00 p.m. not far from the crime scene in Highlands on Tuesday. 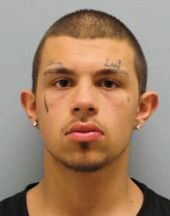 He has been charged with Capital Murder in connection with the death of Otis James. Anyone with information about the case is urged to contact Crime Stoppers at 713-222-TIPS or the Harris County Sheriffs Office Homicide Division at 713 967-5810. CROSBY, (April 4, 2013)  The local school board is trying to keep pace with the an economy in transition as it voted unanimously to pass recommendations by the administration on March 25. A 3% increase on midpoint salary for all employees has been approved for the 2013-2014 fiscal year. The measure passed 7 to 0. The board voted to make external equity adjustment to current teacher salaries for next year. The 2013-2014 Staff Plan passed to take on 37.5 new positions, including 24.5 professional positions and 13 paraprofessional positions. The board approved stipend adjustments for next year. Food service workers will get increased work days. The board voted to change policy to delegate the Superintendent the final authority to employ contractual employees for teaching positions. The new employees recommended by the Superintendent were employed. The Crosby ISD 2013-2014 Teacher Contract recommendations were passed. The depository contract with Community Bank of Texas was extended for a two year term beginning September of this year. 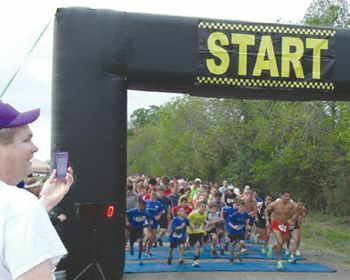 CROSBY  Jog for the Journey was packed with 325 participants and 20 sponsors last Saturday as the running group adopted the memorial foundation for Cody Stephens. The Cody Stephens Go Big or Go Home Memorial Foundation in partnership with East Houston Regional Hospital has been dedicated to help get heart screenings for Texas students with results from Crosby students needing physicals for athletic endeavors receiving them free next year and free to those potential athletes from 7th grade to 9th grade the next year and new students moving into the district, also heart screenings offered to all students wanting them next year for just $15. 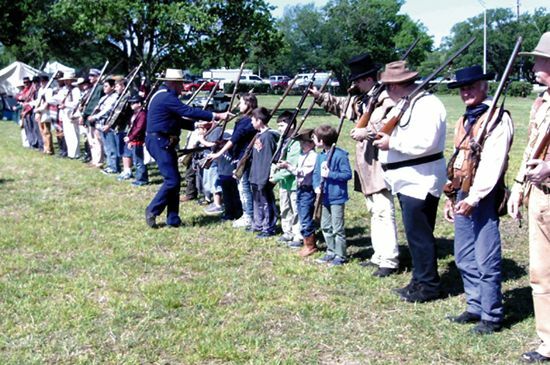 But the results do not stop there, the efforts have reached all the way to House Bill 1319 Codys Bill in hearing next week in the Public Education Committee in the Texas House of Representatives. The House Bill 1319 has seven cosponsors. This week at the Awards Presentation inside Crosby High School, Scott Stephens received for the Foundation $450 raised by Crosby High School Cheerleaders for T-shirt sales and $1000 from P.A.C 10 A.M. to help fund the screenings over the next three years. Visit the website http://codystephensfoundation.org to click the donation button. Overall Winners in the 5 K event were Female Heidi Brewer 23:36.9, Sonja Berrones 25:32.5 and Lucy Holden 26:50.4. Men Sal Rivera 18:38.9, Leno Rios 19:02.1 and Leroy Valladares 20:55.6. In the 10K Raymond Cruz finished with 43:28.8, Earl Tubbs 43:41 and Carlos Rodriquez 46:36.9 and womens 10 K Stacy Holden 39:37.5, Norma Hernandez 40:36.9 and Crosbys Courtney Lively 41:18.4.